Sending a basic chat message is easy: just type your message into the chat input area and press "Enter". Be advised that any player assigned a "Character" (from the Journal tab) can choose via drop-down to talk as either themselves (their registered login name) or as their assigned character. This drop-down menu can be found directly below the chat text box. If "Enable chat avatars" is checked off in the Settings Tab on the sidebar, mini avatar icons will display to the left of chat entries. The icon will change depending on whether a user is chatting as themselves or as a player assigned character. You can hit shift enter while typing in chat commands to get to the next line. Each line will be individually interpreted allowing you to send multiple styles of chat together, preventing them from being split in the chat by other player's messages. /me strikes a valiant pose. Evil doer, beware, I am on your trail! /w gm This is the signal that the thugs I paid are waiting for. Rolling dice in Roll20 is easy. Just type the /roll command into the text chat box, followed by a formula. In most cases, the formula is the same as the one that's printed in your game's instructions. For example, you might know that to roll an attack roll you need to roll a "D20 plus your attack modifier". 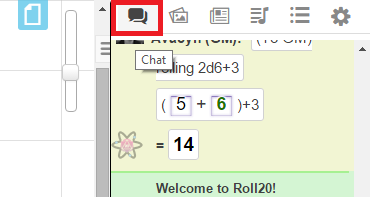 In Roll20, you would just type /roll d20+5. If you hit and you need to roll 3d6+2 damage, you would just type /roll 3d6+2. Finally, you can also string multiple rolls together. If you have an attack that does two types of damage, you might do /roll 2d6+5 + 1d8. So, the overall format for a dice roll is /roll NdX+m where N is the number of dice to roll, X is the number of sides of the dice, and m is the (optional) modifier, which can also be negative. After the roll is performed, you'll see the results of the roll in the text chat area. Notice that for each group of dice that were rolled, there will be a group of numbers in parentheses, representing the result of each individual dice that was rolled. You'll also see the total of all the dice values plus modifiers to the right of the equals sign. Be sure to check out the Dice Reference if you need to use more advanced dice mechanics. Note that you can also use Macros and Character Abilities in your rolls. Just press # and start typing to see a list of your macros, or % for a list of your Character's abilities. To whisper, simply type /w and the name (either player or character) you wish to engage via whisper. Do note that there is a tab-auto-complete function for names to speed this process. Example: /w Galstaff Then how come you had to cast magic missile? Example: /w Rob Where are the Cheetos?! You can quote the name of a character or player if it contains spaces. Example: /w "Galstaf, Sorcerer of Light" You didn't say you cast it, so you didn't, ok?! Example: /w "Rob Schrab" Where's the Mountain Dew?! To whisper directly to the GM, type /w gm. You can also perform a roll that only you and the GM can see, with /gmroll 1d20+5. Example: /w gm I'm attacking the darkness! At this time, only GM whispers are retained in the Chat Archive, and they are only shown to the GM. A player or the GM can whisper to themselves using the /w or /w gm commands where applicable. Note: Whispering to a Character will send the message to all Players listed in the controlled by field, which may include the GM. This fact is often used to make an "in-character language" Character for Campaign setting languages like Elvish, Dwarven, Orcish, etc. The Language Character can then be whispered to for only Players who have Characters that understand that language. To emote, type /em and whatever action you want stated. Be advised that you will emote by whatever you are currently speaking as (player or character). Emotes are formatted as center aligned, bold, italicized and set in an orange font and highlight. *With new update the font has been changed to brown for better visibility, no longer is orange. /em takes out one of his throwing daggers and brandishes it threateningly. Bradley takes out one of his throwing daggers and brandishes it threateningly. To state something while Out of Character (OOC) type /ooc or /o and whatever you wish to say out of character. OOC entries always appear as the player (e.g. "Riley D.") rather than the Character you have selected in the "Speaking As" drop-down (e.g. "Orrbain"). /ooc I could really use another Red Bull right now. Riley D.: I could really use another Red Bull right now. If you put a back-tick ` at the beginning of a command, it will not parse anything about it (inline rolls, variables, etc.) Instead it will just output your text directly. This might be useful for sharing macros with others while in-game. To turn off your chat display for all others, including the GM and the chat archive recording, use /talktomyself or /talktomyself on. Use /talktomyself again or use /talktomyself off to disable. Note: the /talktomyself command and what you want to say must be on different lines and you cannot use it in the same macro as what you want to keep hidden. Recommendation is to have a separate macro to toggle the talktomyself state and then use your other macros that actually do what you want. This is my evil secret plan to steal the gold from my party! Note: API commands (a Pro subscription feature) will not be executed when /talktomyself is on. This section is about a feature exclusive to Pro subscribers, or to players in a Game created by a subscriber. If you'd like to use this feature, consider upgrading your account. Source ID is the id of a token which is the point of origin of an effect. Target ID is the id of a token which is the point where the effect is focused. It is only required for directed effects and will be ignored by area effects. Information about the default effects' types and colors, as well as instructions on how to build your own custom effects, can be found on the Custom FX page. Custom Effect Name is whatever you typed in the Name field of the Edit FX dialog. Adding text following the /desc command will not be designated to have been spoken by anyone. This is for the use of the GM to describe something in a scene. Descriptions are formatted as center aligned, bold, italicized and set in a black font and light grey highlight. A GM can speak or emote as an NPC that doesn't have a character entry made in the Journal tab. To speak as non-situated character, a GM should type the command /as, followed by a space, then the character name in quotation marks and then with what the GM wishes the character to say. /as "Sir Bearington" I'm going to eat you for breakfast. Sir Bearington: I'm going to eat you for breakfast. To emote, follow the same process as above but use the command /emas. /emas "Sir Bearington" charges at you! Sir Bearington charges at you! Note: Including an image is just putting in a link to an image. If the link ends in ".png", ".jpg", ".jpeg", or ".gif", we will automatically insert an image tag in addition to linking to the source image. Sometimes you want to do simple math in your chat. For example posting the damage done by a weapon and subtracting the modifier. To do so you can simply put it into double square-brackets like those "[]". This will pop up a message where you put your modifier in which then will be subtracted from your base strength 5. You can now pop-out Text Chat to a new window. To do this, simply double click on the Chat icon at the top of the right of your Virtual Tabletop. The chat window will keep a running history of everything entered. This history will persist between sessions, and is always available. You can also access a complete archive by scrolling to the top of your chat log, and clicking View all chat entries for this game >> This will load the chat history in a new window. There's a button on the My Settings tab called "Clear Current Chat Log". When pressed, it will clear all the current chat history from your chat window while in a game. This doesn't affect the archived chat history that you can access from the Game Details page nor does it affect anyone else's view of the chat history. If you reload your browser, the chat history will be once again visible in the game. If the GM wishes to delete the entire Chat Archive and start fresh, they can do this by clicking the button in the Game Details page called "Clear Chat History". Note: This action will PERMANENTLY erase ALL of your chat from your game, so use this option with care. This page was last modified on 8 February 2019, at 16:06. This page has been accessed 642,967 times.